Welcoming a baby is, to say the least, life-changing. To help with the transition, the company offers generous extended parental leave—which it's expanding even more in 2017. On the surface, families around the world might seem quite dissimilar. We eat different cuisines, speak different languages and often follow different customs. But look a little closer and you'll see that we also share a lot in common—especially when it comes to the value we all place on welcoming a new baby into the world. Having a child can be an amazing experience, but it's also a rite of passage that requires effort, patience and—perhaps most importantly—time to bond as a new family. This is why Johnson & Johnson is so proud to announce that it is expanding its international maternity and paternity leave policies, so parents can take the time they need to be with their little ones in those first formative weeks of life. In the U.S., new parents (including fathers and those who adopt) can take eight additional weeks of paid parental leave, on top of the company's current leave policies, during the child's first year of life. So, for example, new mothers who've given birth can now take up to 17 weeks off from work without missing a paycheck. And by the end of 2017, Johnson & Johnson employees across the globe—including countries like Brazil, China, India, Japan and the United Kingdom—will be eligible to take a minimum of eight weeks paid parental leave for birth or adoption. 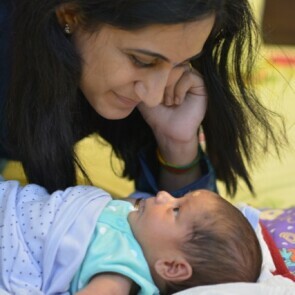 To showcase just how valuable such a benefit can be, we went straight to the source: Johnson & Johnson employees around the world who've taken advantage of the company's already-generous parental leave policies. They share with us their personal stories of why those early days of new parenthood were such a special time to be treasured. "Despite an uneventful pregnancy, my wife’s water broke at 35 weeks—five weeks ahead of schedule. Because of this, our baby's lungs hadn't matured enough to allow him to breathe on his own. Rafael was intubated and taken to the neonatal intensive care unit, where he stayed for 15 days. You can imagine how difficult it was for us to leave the hospital without our son. My wife and I went to the hospital in the morning and stayed until nighttime every single day of my 15-day paternity leave. The 10 days of extended paternity leave gave me the opportunity to be by my wife’s side, sharing those difficult days. It gave me peace of mind. 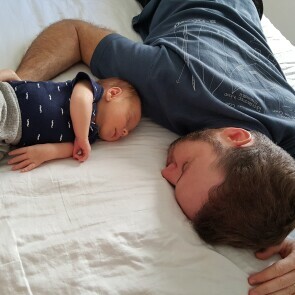 In Brazil the legal paternity leave is five days, so the 10 days of extended paternity leave granted by Johnson & Johnson gave me the opportunity to be by my wife’s side, sharing those difficult days, being with my son and talking to the doctors. It gave me peace of mind. Amy Chu Nguyen Senior Savings Plan Analyst, U.S.
"When my daughter, Abbey, was born, being home with her those first few months was crucial for both of us. For starters, I needed to recover. I ended up having a C-section, which was totally unexpected and much more difficult than I could have imagined. Once I felt better physically and emotionally, I started taking my daughter to mommy-and-baby classes, the park, and to visit with family and friends. These things might sound simple, but being able to take her to a music class in the middle of the week isn't something I would have been able to do if I had to rush back to work. Some of my favorite photos were taken on a nearby beach during the middle of the week, when we didn't have to battle the crowds. Every now and then, I'd have my laptop out and think about logging into work email, but then I'd stop myself. I knew those moments with my daughter were precious, and I didn't want to miss any of her 'firsts.' It really does go by so fast." "When our fourth child was born, my wife got mastitis—an infection in the breast tissue—and was sick for more than a week. I was so glad that I could be there for her and our children. I did absolutely everything while she was on bed rest—cleaned the house, did laundry, prepared meals and took the kids to preschool. It made me think of those dads who didn’t have the kind of leave that I did. How would I have felt sitting at work, knowing my wife was so sick and left alone with all four children? Plus, taking parental leave enabled me to also bond with my older kids. They helped me out by getting diapers and bottles, so there was this special atmosphere at home of us working together to welcome the new baby and adjust to our new family life. I still remember that first bath with all of the kids. I thought: How could my wife possibly do this all by herself all the time?! Thanks to the parental leave, I could go back to work after my wife fully recovered and everything was under control. I was actually the first employee in my department to ask for paternity leave. Honestly, it was a difficult thing to ask for—Japanese people attach a great deal of importance to being responsible and punctual at work, regardless of personal and family matters. I felt conflicted between my traditional beliefs and our real-life situation. I really tried to relish the little moments. I'll always remember how, at 2 months old, he started giggling, and I thought: Wow, he can actually laugh! We were playing with some toy on the bed, and even though I wasn't sure what he found so funny, I was determined to make him do it again. Shortly before I returned to work, when Ved was 5 months old, my husband and I decided to take a mini family vacation. The three of us flew from our home in Mumbai to Kerala, where we spent about five days just enjoying the natural beauty. I loved seeing my little one react to his new surroundings—he loved the seashore and wanted to be on the beach the whole time! My time off also gave me enough time to create a plan for childcare and introduce weaning. I strongly believe that a happy and satisfied person can be a more productive employee. 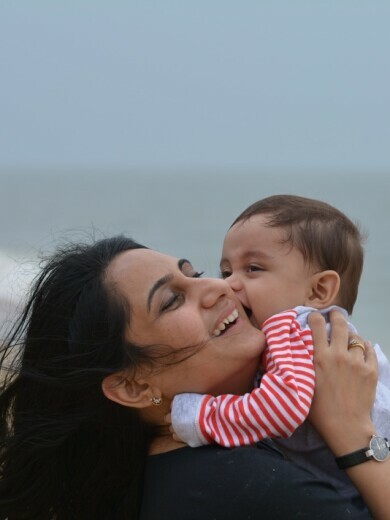 The time I could spend with my son gave me joy, which made me confident and energized when I returned to work." Kate Hewlett Business Operations Director, Medical Devices, U.K.
"My daughter, Evie, was born on my birthday. Everyone says your life changes after becoming a mother, but I really had no idea what to expect. I've always worked really hard and managed teams at work, so how hard could one baby be? But she was a horrendous sleeper, and I could barely get us out of the house each day. It was all-encompassing and the biggest challenge I've ever faced. The most wonderful part of my maternity leave was that it enabled us to spend time with my grandma, Evie's great-grandma. I made an effort to see her a lot—having Evie there made her come alive. I took 10 months off from work, six of which were paid through a combination of maternity leave pay and accrued vacation time. Once we settled into a groove, I loved being able to dedicate myself to her without other distractions. We started going to baby music groups, baby massage classes and support groups for new mothers, where I formed close-knit friendships with other women who were going through the same thing. The most wonderful part of my maternity leave was that it enabled us to spend time with my grandma, Evie's great-grandma. She's not in great health and is confined to her home, 90 minutes away from us. While I was on leave, I made an effort to see her a lot—having Evie there made her come alive. Now when we visit, Evie will run up to her and put her head on her knee. It's quite special to see what a bond they have." "When you have a brand-new baby you're really getting to know a new person. After my daughter, Olivia, was born, I stayed home with her for about five months. That time was essential for understanding her personality and preferences. What does she like? What doesn't she like? I was determined from the beginning to find out. My husband and I love books, so when Olivia was born, I wanted to get her interested in them. It might sound crazy, but I bought more than 100 books for her. We'd read in the morning after breakfast, in the evening before bed and very often during the day. I tried every single book to figure out which one was her favorite. It turned out to be a bedtime book with a lot of pictures. The characters are all made in different materials, and she loved to touch them. Now that she's a little bigger, we have a special reading area for her at home. On weekends, her daddy also loves reading to her; they can spend half the day looking at books! But the good-night book that she discovered early on is still her favorite." 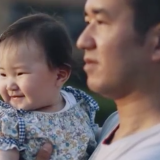 Learn more about Johnson & Johnson's support of parents in this video about one employee's paternity leave experience in Japan.